Today is the sixth day of the Chinese New Year, according to traditional Chinese beliefs, it is a HORSE DAY. It had nothing to do with the year of Horse, every 6th day of the first month of Chinese Lunar year will be the horse day, the birthday of horses. Haha. On the contrary, the seventh day of Chinese New Year is the human day or “ren ri” (人日）。 It is believed that human beings were created by an ancient legendary lady god Nu Wo (女蜗）and therefore, the seventh day is every human being’s birthday. Whether this is true is up to individual. 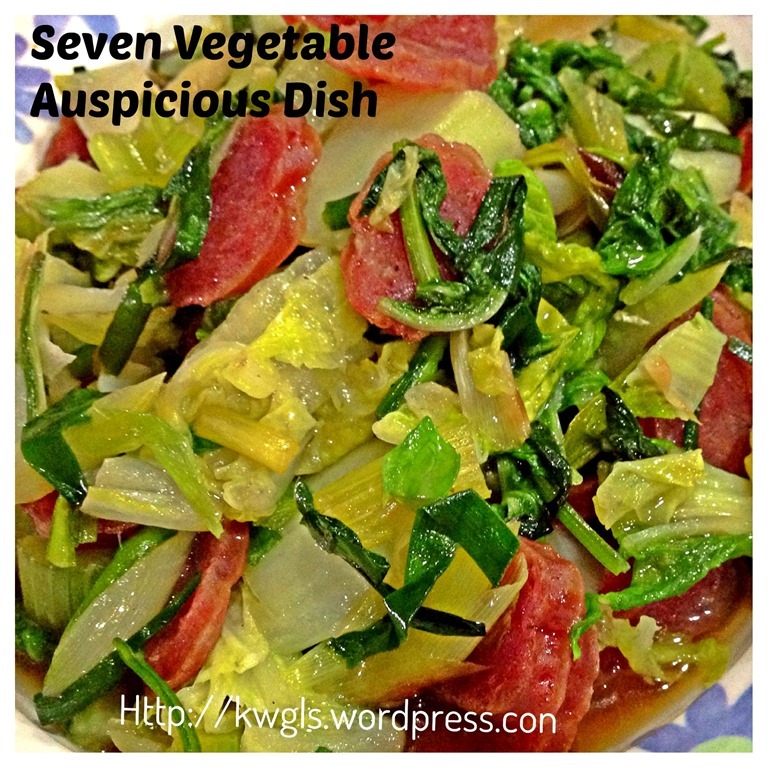 Since it is the thousand years beliefs passed down from our ancestors, I opt to adhere this simple tradition of having a seven vegetables dish. If you are interested to know about Chinese culture, according to a book Questions and Answers on Rites and Customs (答問禮俗說) by Dong Xun in Jin Dynasty, the lady god when she created living creatures in the world, she created the creatures in this order. 1st day – chicken , 2nd day – dog, 3rd day – boar, 4th day – sheep, 5th day – cow, 6th day – horse and 7th day – human being. As from 8th day onwards, what she created is unknown… So on the 7th day, it is human beings’ birthday. So Let’s start celebrate our birthday together.. 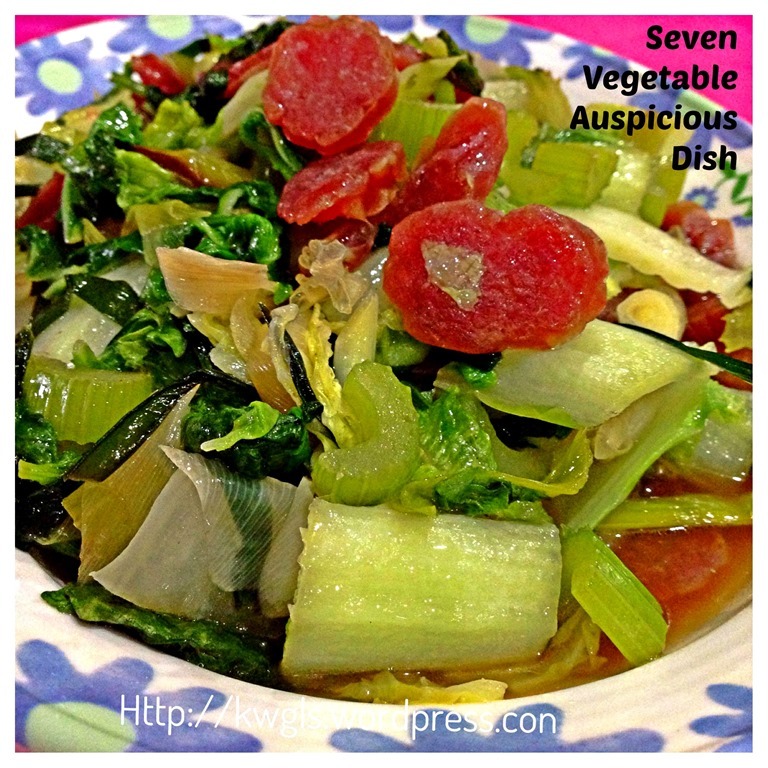 Since spring onion and chives were used in the above vegetable combination, obviously it can’t be a vegetarian dish by religion, therefore, I have opt to prepare it together with some Chinese sausages or meat slices. 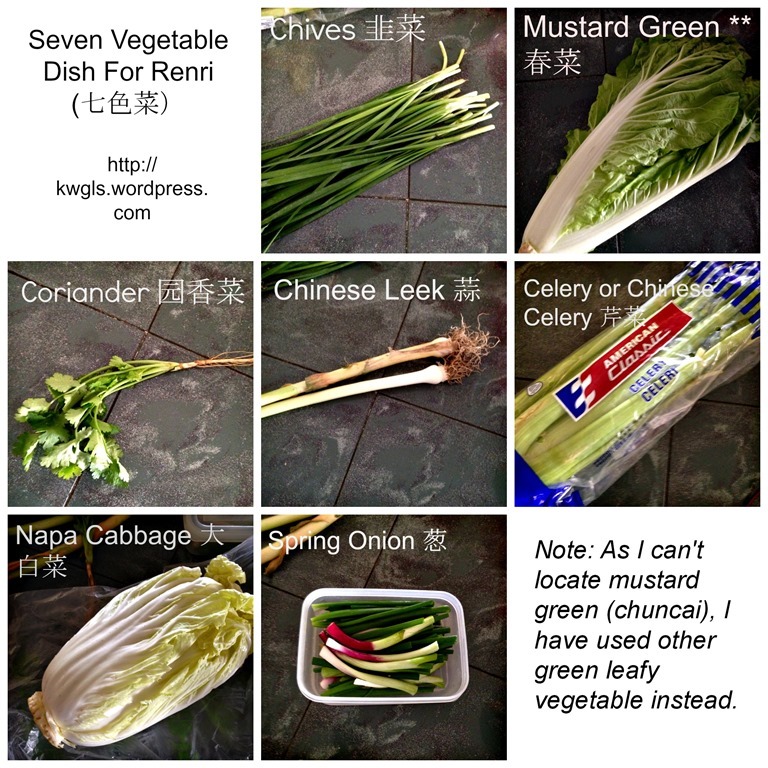 Otherwise, alternatives will have to be located to replace Chinese leek and spring onion. (Note that leek and spring onion were considered as “meat” for religious purposes). In a frying pan, put 2 tablespoons of cooking oil. 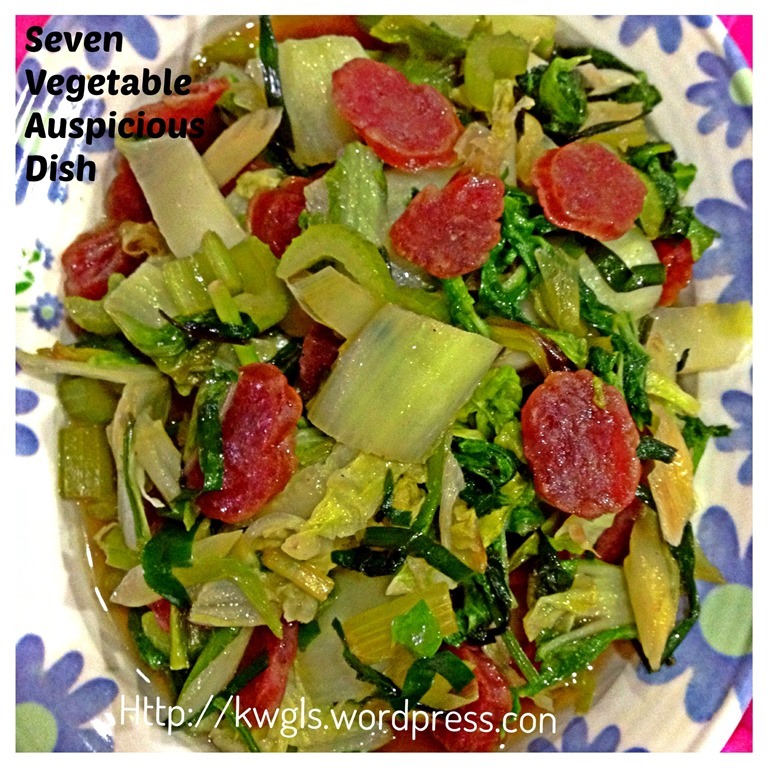 Add Chinese leek and chives and celery and stir fry for a minutes or two. Add in all the other vegetable follow by 1/4 cup of water. Let it simmer for 2-3 minutes. 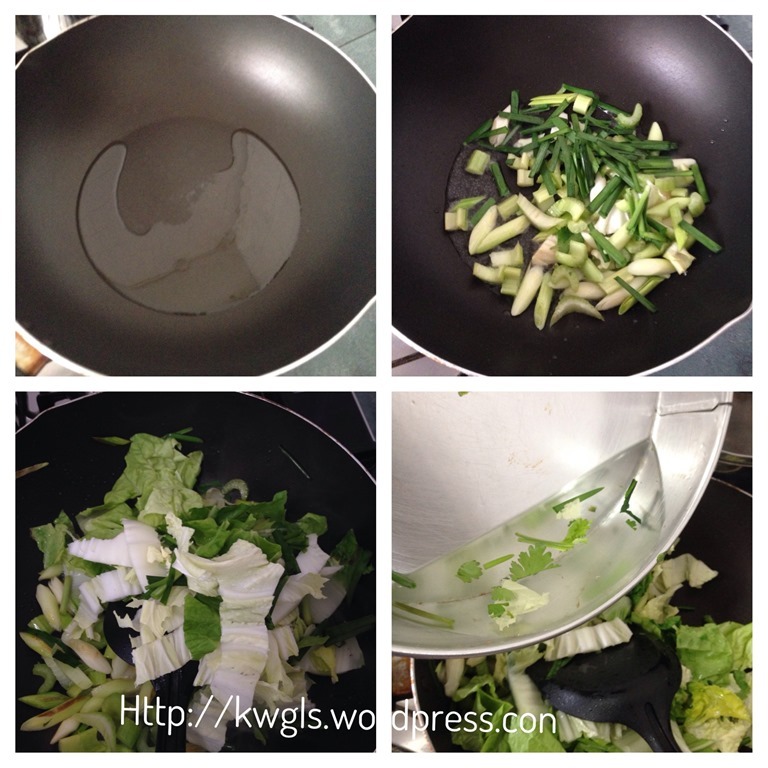 The order of the putting the vegetables and meat are as follows: if you are using meat slices, after Chinese Leek, meat slices, celery, chives, white stem of napa cabbage and follow by all other green leafy vegetables. Those vegetables that took a longer time to cook have to be added first. 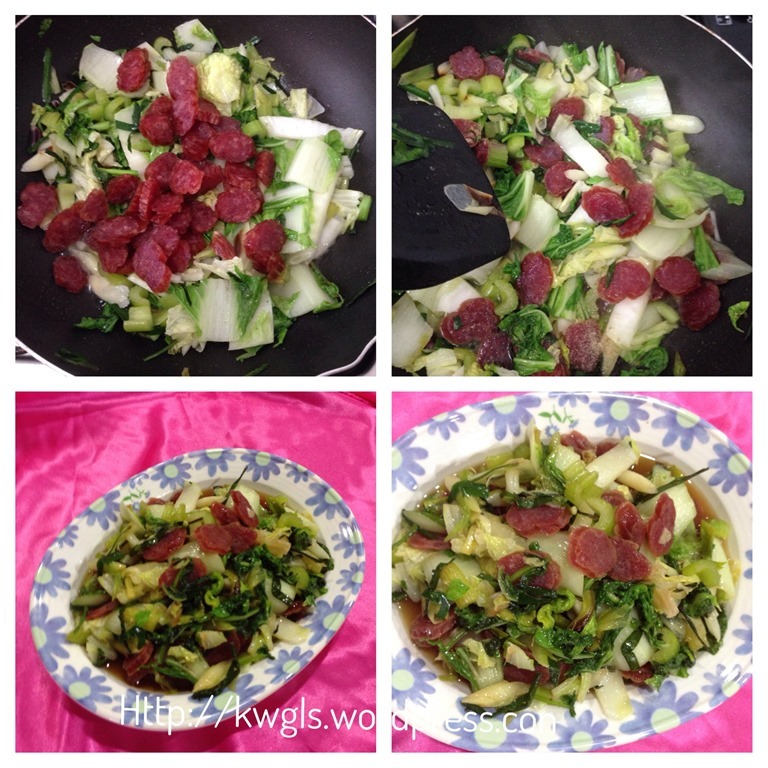 Add the Chinese sausage, stir fry for 2 minutes, add seasonings to taste (light soya sauce, sugar, salt, white pepper). Off the heat and put in the serving plate. Best served hot with white rice. 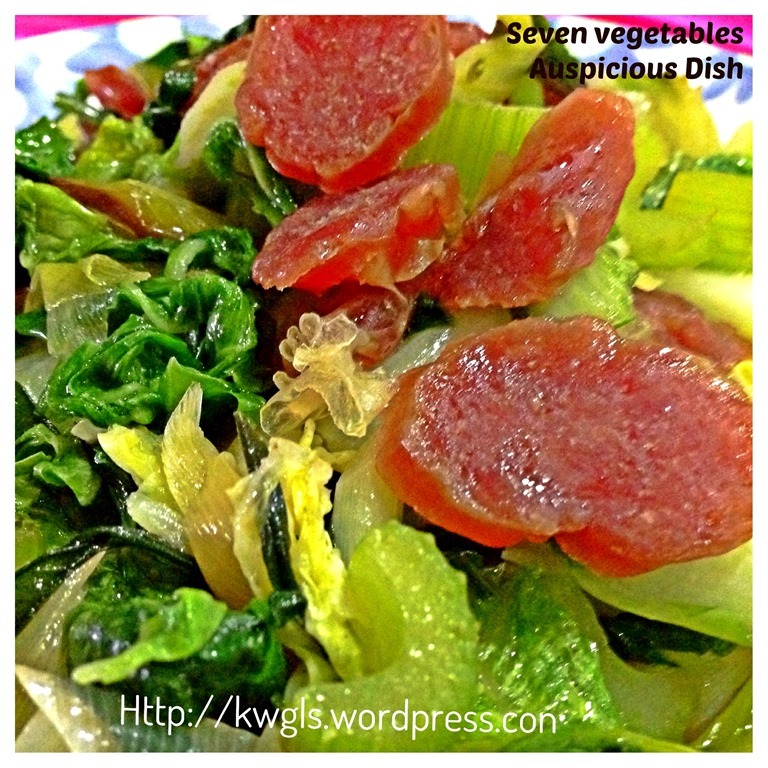 (note that if you prefer, you can add in the Chinese sausage earlier. However, because it tends to get burnt, therefore, i have added it at this stage). Is this a recipe? I do not know. What I want to share with readers are some traditions that were practised by some Chinese clans. Well, if it did not trouble you much, why not try preparing it. If you go to Singapore wet market on the 7th day of the Chinese New Year, some vegetable stalls already have a ready package mix all the vegetables for you. Don’t be shocked that they sell you only one leaf of napa cabbage instead of the whole napa cabbage. Ha-ha. Hope you like the post today and hope that you enjoy your birthday tomorrow. 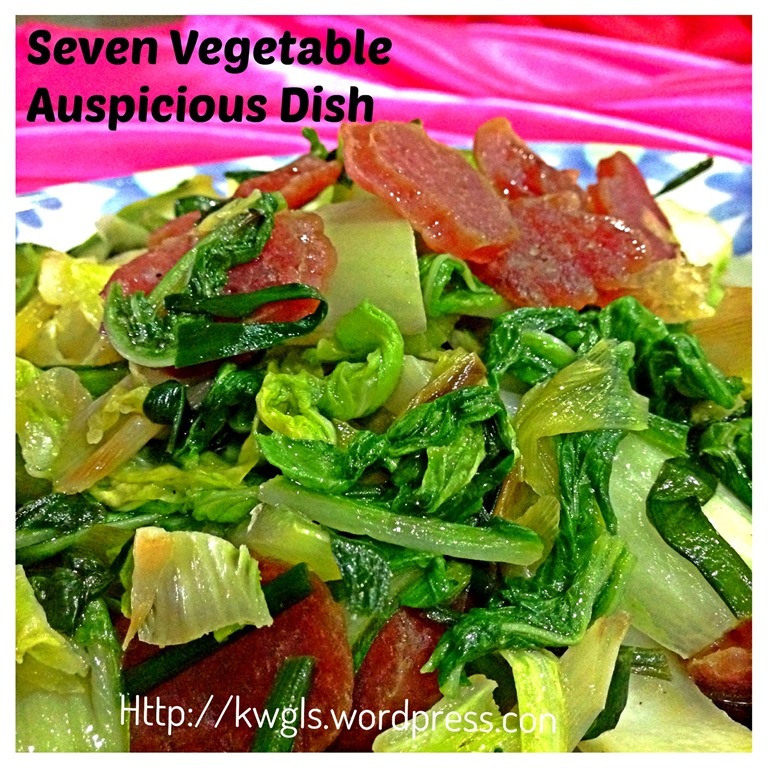 Be in yusheng, seven vegetables soup, luicha (擂茶） or this dish, sincerely hope that you and your family are of good health in the coming year. Cheers. 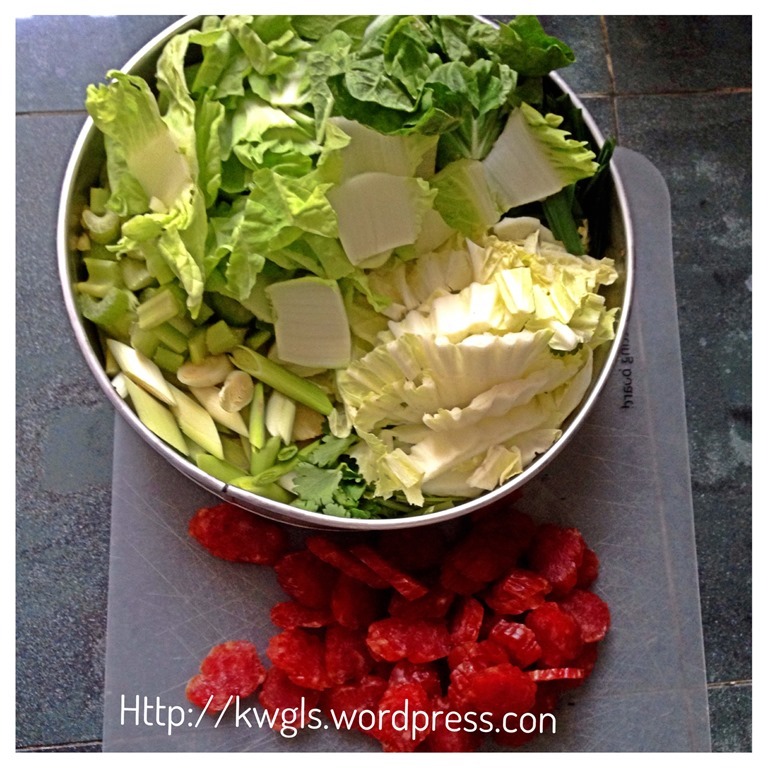 This entry was posted in Chinese and Asian Cakes and Snacks, Food Preparation Series, Vegetarian and tagged 8, GUAI SHU SHU, Guaishushu, kenneth goh, postaday, 人日，七色菜，七式菜，七菜羹，七菜粥， Seven Vegetable Dish. Bookmark the permalink. 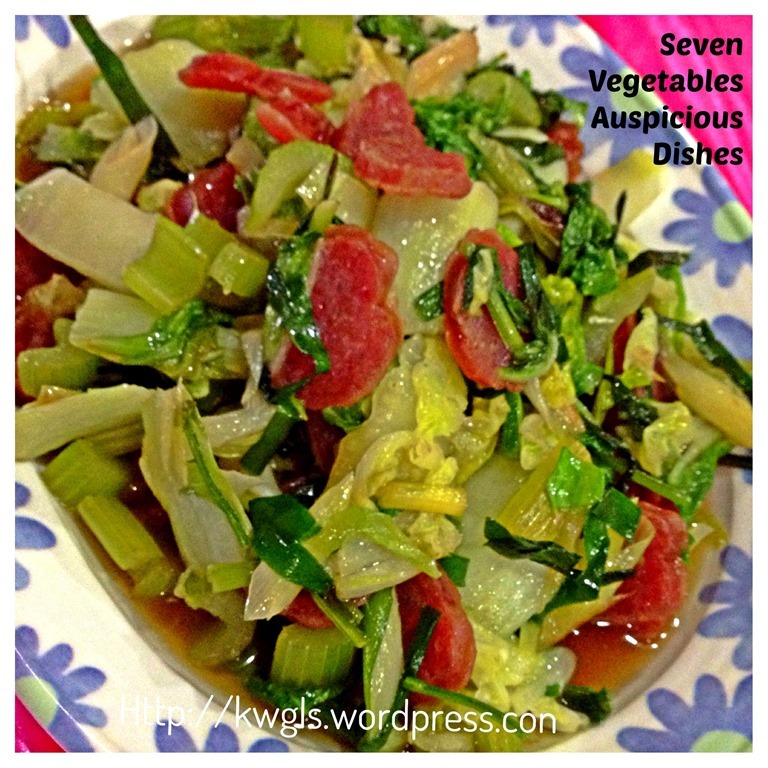 Ken, I always enjoy the wonderful stories you include with your recipes! 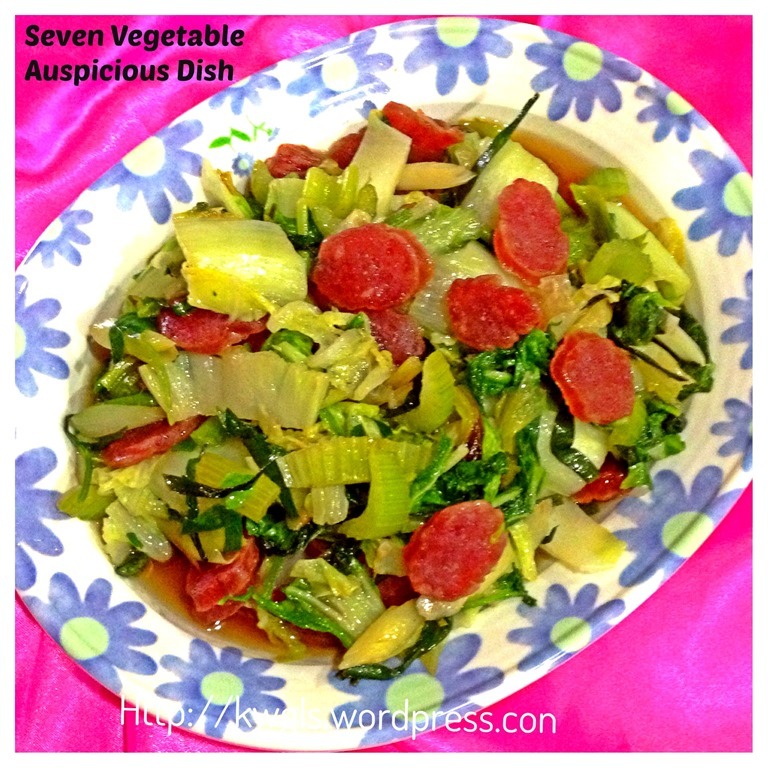 This Seven Vegetable Dish is so fresh and pretty- I love all the colors! Happy Birthday to us! 😉 Thank you for sharing this at Treasure Box Tuesday! Thanks for your interest in Chinese culture. It is my pleasure to share, Joy. I love your dishes.. 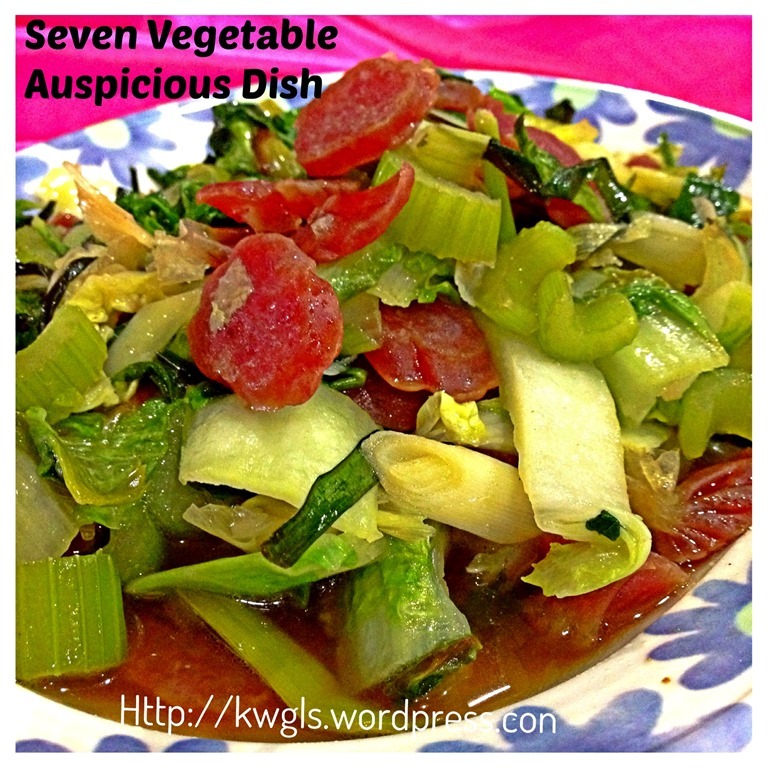 So interesting to see foods from the Chinese culture. Thanks for sharing these on Foodie Friends Friday Valentine’s Party and I hope you will join us again this week for our Snack Food Theme.